THE OFFICIAL PARTY HORN is the perfect way to celebrate a birthday or special event, sound your patriotism on July 4th, or usher in the new year! With its decorative can and festive packaging, THE OFFICIAL PARTY HORN looks great on any party table. Long lasting and durable, the horn adds a resounding punch to any event. 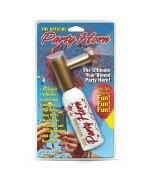 Make your next party a real blast with THE OFFICIAL PARTY HORN from Safety-Sport.